Researchers at the University of Buffalo have done what many others have tried without success. They're created medical tests on a chip the size of a coin. They've demonstrated how their chip accurately determines the eight blood types based on the time it takes each to flow thru the chip. This is a breakthrough. The obstacle has been finding a reliable and efficient way to mix and move blood and other fluids thru a chip's tiny pumps and valves. The UB team have done it. They fabricated a chip that uses two different types of forces - capillary & vacuum driven - to move the fluids in micro and nanosized channels. 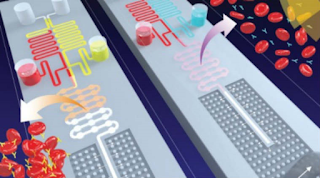 This advance solves a difficult problem that has been an obstacle to labs on a chip. The expectations for the use of labs on chips are big, including in the developing world, on battlefields and in our homes. Imagine, you put a pinprick of your blood on the chip to see if you have strep throat or the flu. This is personalized medicine and med tech at the cutting edge. The new chip requires no sensors or external power source. It advances what the medical world is looking for: inexpensive and disposable labs on chips that are fast, reliable, inexpensive and self-administered.